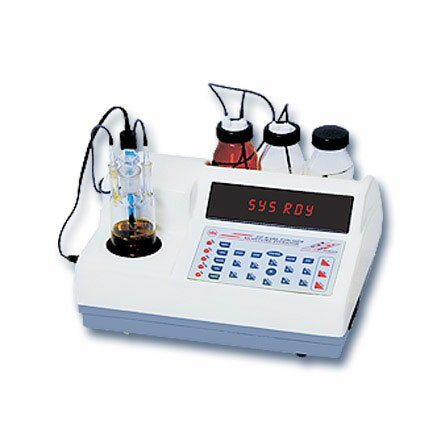 Moisture Titrator | products Categories | Electronics India - Manufacturer, Supplier and Exporter of Analytical, Scientific Laboratory and Pharmaceautical Instruments in India. 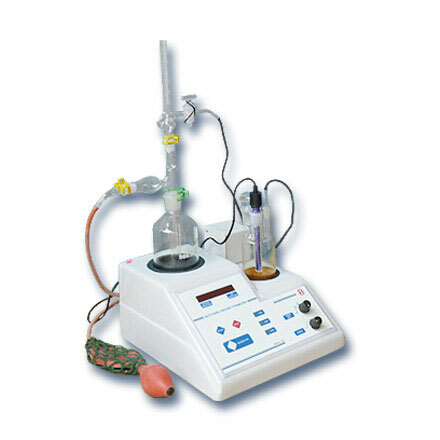 Electronics India is regarded as the leading manufacturer, supplier and exporter of Moisture Titrators from India. Karl Fischer Moisture Titrator manufactured by the company is the finest quality volumetric titrator available. KF Moisture Titrator uses the latest microcontroller technology and advanced engineering techniques so as to give enhanced accuracy and reproducibility. The microprocessor based system is easy to operate and has user friendly prompts which guide you throughout the titration process. The KF Moisture Titrator eliminates the use of conventional delicate and fragile glass burettes and plunger systems. It uses a highly sensitive motorized dispensing system for precise control of titrant volumes. It analyses the moisture concentration of liquid samples, powder, fine particles and fiber samples that are soluble in alcohol or solvents.